The Tories continue their thirty-year civil war on Europe, while Corbyn’s Labour continue to uphold constructive ambiguity informed by their leader’s long held Euroscepticism. The Lib Dems struggle for any relevance after the Cameron coalition. This present impasse has shown the limitations of British democracy and a deep-seated malaise about the meaning of Britain, with Brexit debates reduced to Westminster parlour games shaped by the most obsessional opinions, and a Tory Party in the grip of a reactionary, insular, backward looking English nationalism, which has the potential not only to destroy the Tories but take all of us over the cliff into the abyss. This point even more underlines the challenge to Scotland and the need for a Scottish voice and influence to be brought to these debates. Yet, at this critical point, the SNP has become embroiled in a huge, high powered divide between its two main figures, Alex Salmond and Nicola Sturgeon, which threatens to have lasting and damaging consequences. A recap. Last August the Daily Record revealed that the Scottish Government were investigating the Alex Salmond after two staff members complained of inappropriate behaviour during his time as First Minister. Salmond disputed the claims and took the Scottish Government – which he had headed for seven years – to court claiming their process was tainted. Last week Salmond won his case at the Court of Session with the Scottish Government caving in at the first hurdle, admitting its investigation process had been “unlawful, procedurally unfair and tainted with apparent bias”. It has also emerged that Salmond and Sturgeon had a series of private meetings and exchanges last summer. Salmond requested the first of these meetings - held in Sturgeon’s house on April 2nd - as key individuals became aware of the investigations. Sturgeon subsequently only notified the Permanent Secretary about the first meeting after two months. All of this has left many loose threads and several inquiries. There is an internal inquiry into the failures of its own investigation, an investigation (to which Sturgeon referred herself) of whether Sturgeon she breached the ministerial code, an Information Commissioners inquiry into the handling of the original investigation, as well as an ongoing police inquiry into the substance of the original complaints against Salmond which he robustly rejects denies. This comes on the back of a series of slow simmering resentments which have been building between the once dream team of Salmond and Sturgeon since the indyref, and more acutely, post-Brexit. Salmond – who sees the indyref victory as rightfully his, but stolen by forces ranging from the BBC to ‘The Vow’ – gives the impression that he finds it difficult to leave the stage or to find a constructive role: hosting a tacky Edinburgh Fringe show and then embarking on a broadcasting career with RT (formerly Russia Today). Hyperbolic claims – for example from the BBC’s Sarah Smith – of “outright civil war” in the SNP, lack nuance and can be easily dismissed by Nationalists. But nor can the situation be dismissed as a unionist conspiracy. There’s something serious going on. This is the end of a certain period of the SNP: of its once impressive and self-imposed discipline. This is the end of the imperial period of SNP dominance. They may well for the foreseeable future continue to be Scotland’s leading party, but that will be more open to possible challenge. That isn’t that surprising after twelve years in office. What is surprising is how this has come about. If not a “civil war”, this is certainly already a proxy conflict for all sorts of other divisions, and could clearly escalate further. There are bruised feelings, mutual suspicions, competing stories and allegations, and clearly defined rival camps. The emergence of Salmond and Sturgeon camps with elements in each briefing against each other recalls the recent history of New Labour. Once upon a time Blair and Brown were the closest of allies, but as divisions emerged, slowly at first from the Granita ‘Deal’ to more seriously in office, the ‘TBGB’ problems began. Many in the SNP are hoping this all goes away and that normal politics can be resumed. But it can’t. This has become about more than the original allegations and the failures of government process. 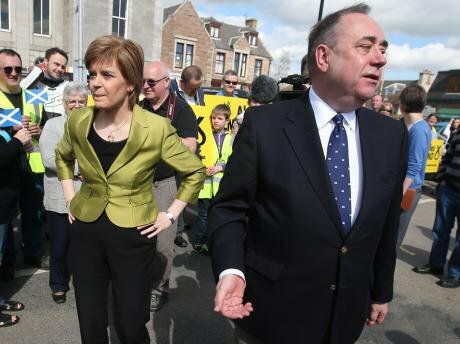 Secondly, this illustrates the different leaderships and political styles of Salmond and Sturgeon. But as important is when in the political cycle each has been called to leadership. Salmond’s second coming in 2004 came when the SNP was in the doldrums and had a mere 8,000 members. He took the SNP from that low point on a rising tide which encompassed the 2007 and 2011 victories and a 45% independence vote. The SNP’s current position is to prioritise a second Brexit referendum – the logic being to minimise the damage of Brexit, exert maximum leverage in Westminster, and speak up for the 62% pro-EU majority in Scotland. But this has also caused disquiet in the ranks with many people seeing it as distracting from independence. Sturgeon stated on Wednesday that she will come back in the “coming weeks” to outline her planned timetable on pushing for a second indyref. This in the context of the above events just doesn’t make any sense beyond the base and true believers, and underlines the damage caused by the lack of any strategy, plan or new offer. How could Scotland realistically consider another indyref when no independence package is on offer or being prepared? And what does that say about democracy and the critical need to speak to, honour, and win over No Voters? If anyone thinks the answer is to win a referendum on the principle with minimal detail (‘Britain is bust, let’s get out’), have a look at the mess that has got politics into on Brexit. There are numerous paradoxes. The SNP is more than Salmond and Sturgeon and their camps. It has 120,000 members, resources and ideas, and one factor stopping this from being Sarah Smith’s “outright civil war” is that so far this has been an elite and leadership faction fight. The mass membership have not yet taken sides. But what is also true is that since 2014 the SNP leadership have consciously tried to manage and exclude the party’s own membership from having much of say in the party or the big debates. A salutary fact is that since 2014 there has been not one substantive debate about independence at SNP conference. Wider tensions are at play. The SNP claim to be a movement when they are a party. The cause of independence is interwoven with the appeal of the SNP, and while they are different, the former is impossible without the latter. But the SNP at senior level have become at senior level the party of insider Scotland - and even, of the status quo. Some of the most ardent Nationalists inadvertently illustrate this when they defend every part of present-day Scotland from criticism – from education to hospital to even train times. Twelve years of dominance as a party in office is a long time in modern politics and the SNP have changed Scotland and themselves in the process. This has shown many of the strengths of the party but also its limitations: the thinness of its social democracy, the conceits of even the most civic nationalism, and its lack of feel and interest in democracy and dispersing power. They are failings that are not just owned by the SNP but by wider Scotland. One era of Scottish politics is drawing to a close, though not in a manner any of us imagined. There was always a conflict even in the 2014 indyref between the emerging Scotland that was more diverse and disputatious towards authority and power, and the bright shiny promise of SNP modernity. Those fault lines have come to the fore post-2014, and run through independence opinion, just as they run through radicals and progressives the world over. Just as the UK enters storm filled waters, the SNP itself is heading for crisis and division, out of which will come a different party, leadership and politics, and from that a different vision of Scotland and independence.